In vectorial drawing softwares like : Adobe Illustrator, Inkscape, Sodipody, Coreldraw, Sketch, we can save our work in a standardized formats. The most popular and known are those used by illustrators : AI et EPS. But there is also a more elaborated and concerted standardization project for the WEB, the SVG format. At last, there are more unknown and unusual vectorial formats, like the paths export format used by GIMP. Those formats are not yet read and interpreted by Blender wich is mainly used for 3D modelling. However, Blender is offering tools to deal with beziers curves and a python module to modify them, alas, the python module is not yet enough developped to create them directly and adding points or vertices (the command does exists, but only for NURBS curves). This command is the key wich will allow to open and read a few type of file formats, the .BLEND files themselves of course. But also the .DXF,.VRML...VIDEOSCAPE files. The VIDEOSCAPE format is the NEOGEO one, the firm where the first versions of the software was developped . It is established that ( this is mentioned in the Blender official documentation, at least the one from 1999 the period the software was a shareware) this format can contain information on curves POLYLINE, NURBS, and BEZIER. Still better, when you load it, these type of curves are automatically created, and even in the very last versions of Blender. Thus, to import AI, EPS, GIMPpath ou SVG files, you have to translate them into VIDEOSCAPE format first. As we see, this is a very bald format, and if we can easily guess that the 4x4 series of figures are square matrix and that the other 3X3 series represent vertices locations with their control handles, other lines are rather abstruse. line 4 : ext1 ext2 -The value to extrude numbers, given for surfaces too. line 7 :pntsu pntsv - number of vertices in u and v directions. line 8 :resolu resolv - fineness /resolution in u and v directions. line 9: :orderu orderv - order in u et v directions. line 10 :lagu flagv - The 'cyclic' flag in u and v directions. Cyclic if equal to 1.
line 13 :x y z - 3 control handles. 0.0 0.0 0.0 1.0 """
2/ The order of coordinates submission must be oriented on the XZ plane otherwise the shape is completely flattened out. 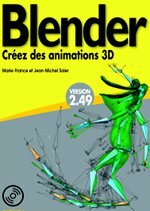 3/ To have the Blender.Load() function available you need the 2.34 Blender version at least or upper (the 2.33 versions compiled from the CVS of the 20th july 2004 work too). But it is still possible to recover the intermediary file in wich the curves data before importation are stored. This file is in the same directory as the original file, and has the same name without extension with addition of "OOO.obj". There is not any risk to mash the original file up. - the disappearing of this ability is possible in the next versions of the importation curves module to be replaced by a sole temporary file wich will be located in the "bpydata" directory. 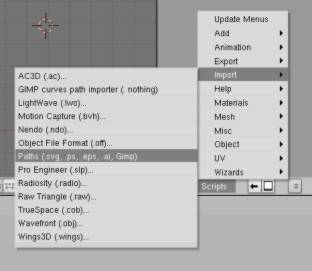 4/ When the object file is loaded, the name of the current blender file is modified. If you are not carefull, you may save your work with a bit complicated extension name. The coders of the python's API have solved the problem and this bugg should disappear in Blender 2.34, official version.